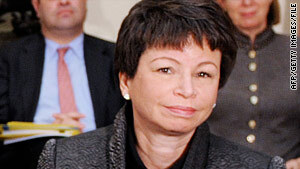 White House senior adviser Valerie Jarrett says President Obama has dramatically changed how the U.S. is seen. Washington (CNN) -- The White House rejected criticism Sunday that President Obama has not delivered on his promise of "change" during his first year in office. White House senior adviser Valerie Jarrett said the president has brought about "enormous change." "I think what we've seen is a dramatic difference in terms of how the United States is perceived around the world," Jarrett told NBC's "Meet the Press," on the final Sunday before the president's State of the Union address. Obama's travels have established relationships with world leaders that "lay a foundation for keeping America safe and making us a partner around the world," she added. Jarrett also credited the president with having "pulled back the economy from the brink of disaster." "That's an enormous amount of change when you consider where we were a year ago right on the brink," she said. "And he's adding discipline in government to try to get control over our fiscal house. So I think that we've seen enormous change." Senate Minority Leader Mitch McConnell, on the same program, countered that "if you look at the first year of this administration, we haven't made much progress." He complained about the deficit in the president's budget and the health care reform package that Republicans oppose. But McConnell, R-Kentucky, was also on the defensive about the GOP, which critics have been calling "the party of no." Asked to characterize the performance of his own party this year, McConnell said, "What we did is try to operate on principle. The president decided to go hard left. That's why he doesn't have many of my members [supporting his agenda]. If he chooses to govern in the middle, he will have broader support." Jarrett insisted the president never wavered from his promised bipartisan approach. Discussing his health care initiative, Jarrett said Obama "has sat down with the leadership and members of the Republican Party, both the House and the Senate. In fact, bills in both the House and the Senate contain provisions that were suggested by the Republican Party -- so nothing's changed about the president's approach."